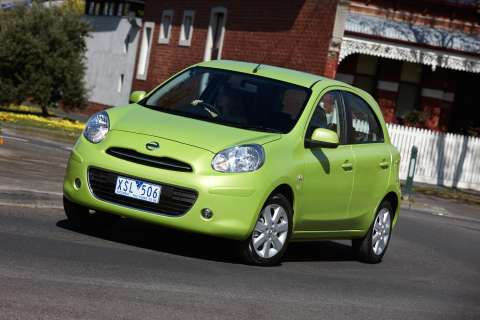 Nissan’s fun Micra Ti: 2QT2Btrue. We loved the old one with knobs on! The concern was that Nissan might have made a slightly regressive step like it did with the Tida which replaced the Pulsar but was half as good as the car it replaced. We needn’t have worried though because it’s (as my dad used to say) a “bottler”. It’s cute and nippy with a 1.5L 75kw engine. It doesn’t sound like a lot but it’s a very small car with a very small appetite. Our test car was the Ti so it get get extras but they are extras you’d expect from a luxury brand. 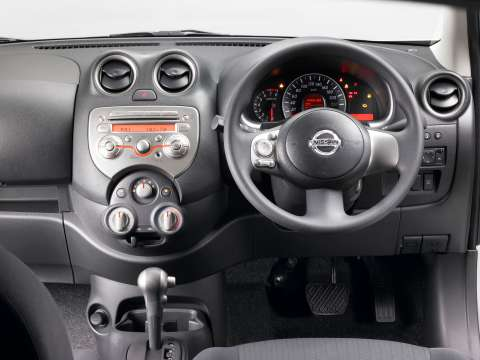 There was keyless entry and start, bluetooth, power folding door mirrors, reverse sensors, alloy wheels, full curtain airbags and climate control A/C to name a few. There were a few things I didn’t like such as the torsion bar rear suspension and the rear drum brakes. I realise it’s an inexpensive car, but there are things that I think we can expect from a car made in 2011 in a country other than China and that is proper suspension and at least a small disc brake on each wheel. Not to labour the point, I liked the Micra before, and I like it now. The finishes don’t feel cheap even though the top model is well under 20 grand. It costs bugger-all to insure and runs on the smell of an oily rag using 6.6L/100k. It’s a common myth the gay people, and gay men in particular, only like driving the top models. There are plenty of us who either don’t care to spend the GDP of a small African nation on a car, or only see a car as transport from one place to another. 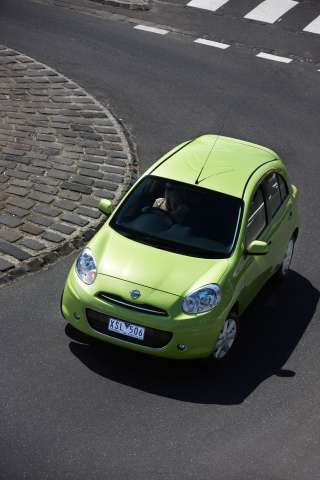 The micra looks ever so cute with a cheeky front end and stumpy hatch in the back. Speaking of the back, Micra passed our “two bags” test easily. You’ll remember we try all the cars we drive with just enough luggage for two boys to have a romantic weekend away. That’s two carry-on bags to the rest of you!! As if that wasn’t enough you have space for you, your very lovely other half, and two friends, for short jaunts around the city. I’m not sure you would want to do a long trip but you could afford to fly with all the money and and carbon credits you’ve saved driving Micra for a year. The over-all feeling is one of space and light and the materials used avoid the look or feel cheap and nasty and there are a few clever tricks to keep you amused no end. The cushion of the passenger seat is usually vacant so those clever little Japanese designers thought “I know, let’s have a gadget”, but then a woman cleaning nearby said “No! I won’t have it. Let’s have something to stop my handbag sliding off the seat instead”. There was much excitement at Nissan Design Central as they brainstormed themselves into a frenzy. What they came up with is so simple, it can’t be true, but it is. Almost the entire centre of the cushion hinges forward and lays flat on the squab. 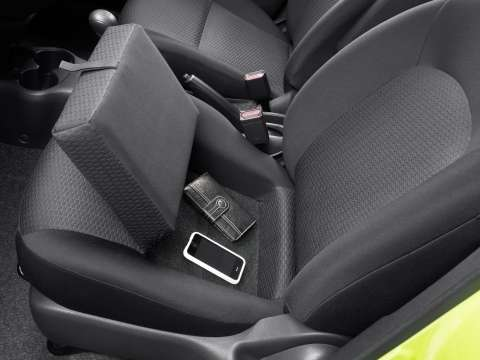 In a stroke of sheer genius, they created a spot for your mobile, or hand bag, or Ipod or a very very small husband. It doesn’t adversely effect the comfort of the bum of your fellow front seat occupant. It’s deep enough to stop most things from being air born at every red light. I don’t know why more brands don’t do it. How cheap is that? You’ve given someone something useful by simply modifying that which is already there. Net cost is ZERO, net benefit can’t be measured because it’s the customer who will find more uses for the cubby hole than Nissan could ever come up with. The instruments are well laid out with the exception of the phone controls. I just can’t understand why they didn’t put the main controls so out of the way especially with no aux buttons on the steering wheel. Someone really boobed there! I like the keyless entry very much but sadly there is no USB input for the audio system. You can still play you ipod but there are no controls for it which is a shame. That also means another cord for charging. 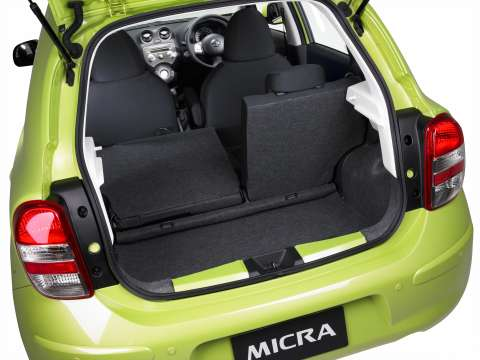 There are auto door locks for anti car-jacking, auto headlights and even better a full sized spare wheel, so although I wouldn’t say Micra is fully pimped, I would say that it’s a pretty good package especially when you compare with the rivals like the Suzuki Swift and Holden Barina. All of this is for naught if the drive isn’t as fun as the looks. Luckily the drive is at least as good as the old car. The light steering is delicious in traffic. Just flick your wrist and the car follows. The auto has a low first gear to get you off the mark fast and as I mentioned the 1.5L engine buzzes along nicely. If you really push it, sure you get understeer, but remember this is an entry level car. 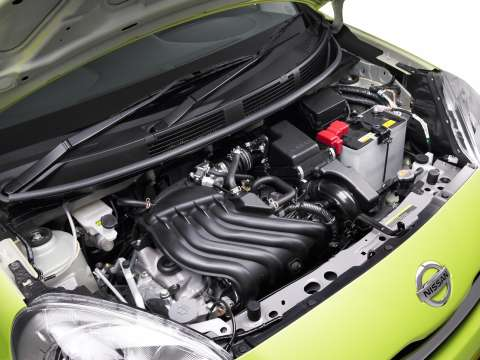 The performance is more than acceptable, and the fuel figures are almost as good as a hybrid. The cheapest hybrid is the Honda Insight, but are you really going to seriously consider shelling out another 15,000 of our Australian dollars, over the price of the Micra, just to get one? 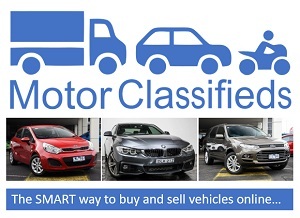 Perhaps your other half is the one to own the sporty convertible or the luxury tourer so the money you save can be spent on gorgeous things for yourself! Not so much: USB – for gods sake if you have keyless entry/start with auto headlights please put a USB in for the damned music! Top Tip 12: do I place place my E tag (for tolls) on my windscreen? It was fabulous in the city traffic. And, it goes places bigger cars can’t go. The thing is we won’t be driving cars the same way in 20 years time. We won’t be using the same amount of petrol.. It’s hard to say, but this time around is far worse than the oil crisis of the 70’s and of course we are still dependent on the Arabs for most of it. Share cars have really taken off here. You pay a monthly fee then use any number of little cars as you choose for a lowish amount per K which includes petrol, tolls, insurance etc. Cheap as chips! It looks very tiny, it might be kinda intimidating to be stopped at a light next to a big truck. But thats a nice price, practicaly free.